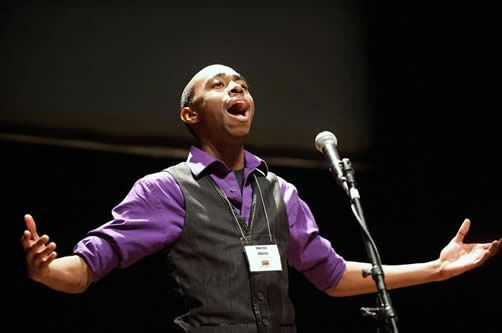 Harron Atkins, a senior at Cass Technical High School, won the 2011 Poetry Out Loud state championship in East Lansing. Atkins won out against 30 other contestants from across Michigan. He will receive a $200 cash award and an all expense paid trip to the national finals in Washington, D.C., April 27–29. Cass Technical will also receive a $500 stipend for the purchase of poetry books. Atkins is the second student from Cass Tech to win the state championship. Daniel Bellomy was the 2009 champion. “The Song of Smoke by W.E.B. DuBois. Atkins gave a powerful rendition of DuBois’ poem in the final round with the other three finalists. 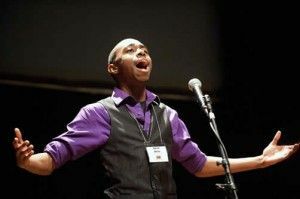 Poetry Out Loud is sponsored by the Michigan Humanities Council, the Michigan Council for Arts and Cultural Affairs, the National Endowment for the Arts, the Poetry Foundation and the National Endowment for the Humanities. Quishanna Coleman of Martin Luther King High School also represented DPS in the competition.